Simply drilled--right on CG with pin 4 inches from PAP. The ball is longer than the creature with a similar arc to the backend. Exactly what I was looking for--a pearl ball that is long but doesn't flip too hard at the back. Works great when the lanes dry up. A few older bowlers with slow ball speed but decent rotation are swinging it on the fresh and scoring well too. Tested on all lane surfaces, synthetic, wood and overlays. First off thanks to Eric for this SWEET ball he sent me! 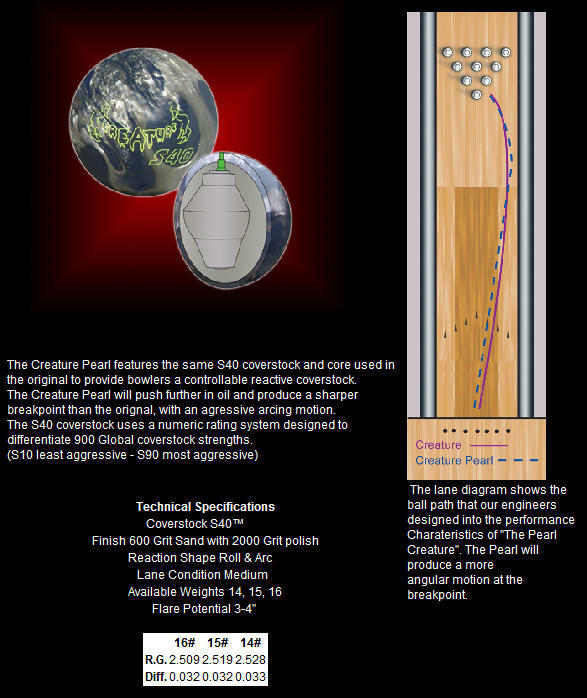 Man does 900 Global make great looking balls, this one, the Break Pearl and the Code are really sharp looking balls rolling down the lane AND they perform! The Creature Pearl - a pearl version of the solid - is a great medium to dry lane pearl. But unlike most pearls this one really reads the dry quietly - meaning it doesn't jump crazy when it encounters dry boards. It wants to roll/arc hard and carries the half ten well. For me it's more predictable than the solid Creature is. I threw this one for the first time on AMF Synthetics on a real wet-dry pattern. It let me stay in the dry for all 3 games - 228-247-215 - 690. Last game some carrydwon cost me some carry but this ball really impressed. I have it drilled with a standard 4 by 4 wiht the box finsih. I can't see changing the surface because it seems to fit a hole in my arsenal - a ball for drier conditions that reads the lane, doesn't go crazy and carries! This is a great mid-priced ball to have in the bag, give it a try and you will not be disappointed. Just got this ball from the guys at the Orleans (K&K Bowling, Joel and Sakae). length and strong move to the pocket. Just drilled me up another Creature Pearl with the rico layout, and i have to say that this is a pattern that I'm starting to like. I bowled with it last night for the first time and was very impressed with the reaction. It was really clean through the heads and had a nice clean roll in the back part of the lane. This drill pattern allows my ball to not to be as jumpy and a lot more controllable for me through the transition. I highly recommend drilling one up and giving the rico layout a try. 257 202 278- 739 First 3 games out the box with the rico layout. Another great ball from 900 Global! This ball is drilled straight up. Pin over bridge, CG in center of palm. If you want a ball you can play all day long try this. If Walter Ray Williams Jr. had one drill for him, he'd be Global for life. I like this ball the best on wood. It does NOT snap it just arcs all day long. The best part about that is nobody will play with your line out there. It just keeps ripping racks. I have to say, you don't want to miss inside, not enough cover to get through the spot to cover your miss left. Could be remedied with a stronger drill but then one would have to move in more....bad idea. Great ball, great look, great reaction. Case closed. Once again 900 Global has hit the jackpot with this piece. I don't know about the rest of you guys in the bowling world but, 900 Global makes some really good balls like the Breaks and the Bounty but lets be realistic in todays leagues the RG factors on these balls is too much for League conditions, blame this one on your bowling centers with the way they oil and wall up houses to boost scores which I think is a slap in the face to people like me who have shot honor scores with Ebonite clear wolf's and columbia yellow dots. Well enough of the whining. I drilled my 15 Pound Pearl Creature with a 135 Degree drilling for drier conditions like the ones I see in Miami, Fl in every house I walk into. well first i left it with box surface, which was too much based on the cover, it burned up on the back end and left flat 10 pins in the first 6 frames I used it so I decided to hit it with Ebonite power house polish. WOW what a difference, this is just what I needed I was able to play the next 3 games in the same area with slight moves killing the pocket. I personally believe that the creature series is a good make for 900 Global. Hopefully this post will help bowlers who understand the game and know what Im talking about listed above and take a chance on 900 Global. "Don't Player hate" "Get Mad at the coach for not putting you in the game"
Page created in 0.678 seconds with 24 queries.